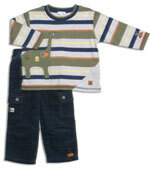 le top "Dino-Mite" navy corduroy pant set. WAS $60, NOW ON SALE!! !